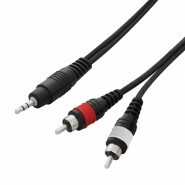 Audio cable, mini jack/mini jack (m/m), 2 m (6') Type: Audio cable Connectors: Mini jack male / mini jack male Legal asp..
N-Series Y-cable - Stereo Mini Phone Plug / 2 x Mono Phone Plug with REAN connectors - ROHS compliant length: 3m/10ft - blac..
Y-cable, mini jack/RCA (m/m), 3 m (10'), black, Deluxe Type: Y-cable Connectors: Mini jack male / 2 x RCA male ..
series 10-metre Y-cable with stereo mini phone plug Connectors: REAN Legal aspect: Compliant with the RoHS directive ..
N-Series Y-cable - Stereo Mini Phone Plug / 2 x Mono Phone Plug with REAN connectors - ROHS compliant length: 1m/3ft - black..
Y-cable, mini jack/RCA (m/m), 1.5 m (5'), black, Deluxe Type: Y-cable Connectors: Mini jack male / 2 x RCA male Le.. 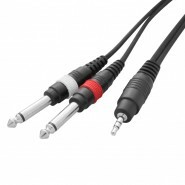 Ideal for Laptop headphone outputs. Can be used for other media players like iPhones excetra. ..